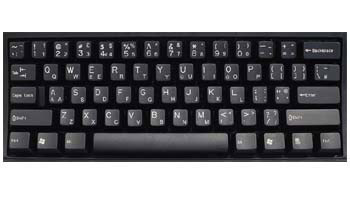 The DataCal English (UK) language keyboard labels are a high-quality, durable and economical solution to creating a English (UK) bilingual keyboard. The United Kingdom (English) keyboard labels conform to the United Kingdom (English) keyboard layout in Windows XP. The labels are printed on clear Lexan® so the original key legend shows through; this allows you to add United Kingdom (English) labels to your existing keyboard so that it becomes a bilingual keyboard (United Kingdom(English) and the original language of your keyboard). The labels are available in blue letters on clear labels (for beige and light colored keyboards) and white letters on clear labels (for dark colored keyboards). This label supports the keyboard layout for: United Kingdom (English). This language is supported in Windows 7, XP, ME, 98, and 95. United Kingdom (English) labels area very economical option for creating a bilingual United Kingdom (English)keyboard. The language labels use an easy peel-and-stick method to install. They will not damage the original keyboard key. The letters are printed on the underside of the United Kingdom (English) labels so that the lettering will not wear out. This affords you with many years of durable use. Characters that require the AltGr key appear to the left in the DataCal labels (see illustration above). On the number keys, theAltGr characters are centered at the bottom of the label. Shifted AltGr keys are centered at the top of the label. For alpha keys, the AltGr characters are in the lower left corner of the label. Shifted AltGr characters (if different from the lower case AltGr characters), are centered at the top of the label.